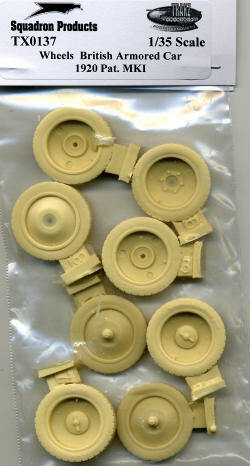 Those of you who are contemplating the build of the Roden Armored Car kit will find these resin wheels a welcome replacement for those supplied in the kit. The wheels come eight to a pack with nicely molded detail that includes bolt heads, valve stems and raised lettering for the Goodrich Silvertown tires. No instructions are provided as none are needed. Simply remove the pour stub, paint and install. My thanks to Squadron Products for supplying the review set. You can find these at your favorite shop or on-line retailer.